New research from Ryerson University's City Building Institute highlights the widespread impact of higher taxes on small businesses. Frédéric Geisweiller's French restaurant began as a small experiment. Le Sélect Bistro first opened its doors on Queen Street West in 1977. Over the years, it grew from one building to the next, then from two buildings to the one behind them, before Geisweiller decided to set up shop somewhere new: A derelict building on Wellington Street West. That blank canvas became the bistro's latest incarnation, re-opened in 2006, with a design Geisweiller had always envisioned — no walls throughout the dining area, a Parisian patio in the front, an almost-secret garden in the back, and a space filled with staff and customers who'd called the restaurant a second home for years, and often decades. Now, after more than 40 years building his business, Geisweiller fears his beloved bistro may be in peril. "Our municipal tax has gone up in a way where the restaurant becomes unprofitable," he said, while sitting on his restaurant's sun-dappled patio. 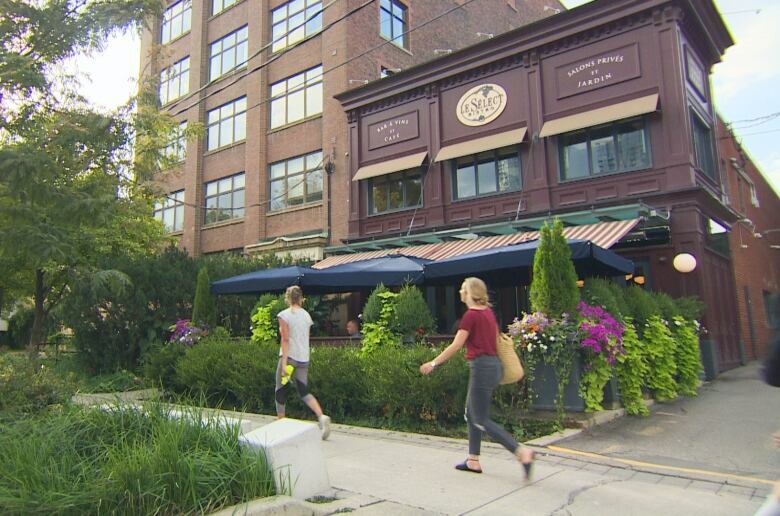 The French restaurant is one of many small businesses across the city at risk of being "taxed out" of Toronto, according to new research from Ryerson University's City Building Institute, which highlights the widespread impact of higher taxes thanks to the province's most recent property reassessment two years ago. And while city council put a tax cap of 10 per cent in place this year after an outcry from heavily-taxed business owners on Yonge Street, many say the situation needs a long-term fix from the new provincial government and next city council — otherwise local businesses on main streets throughout Toronto could be at risk of shutting their doors. 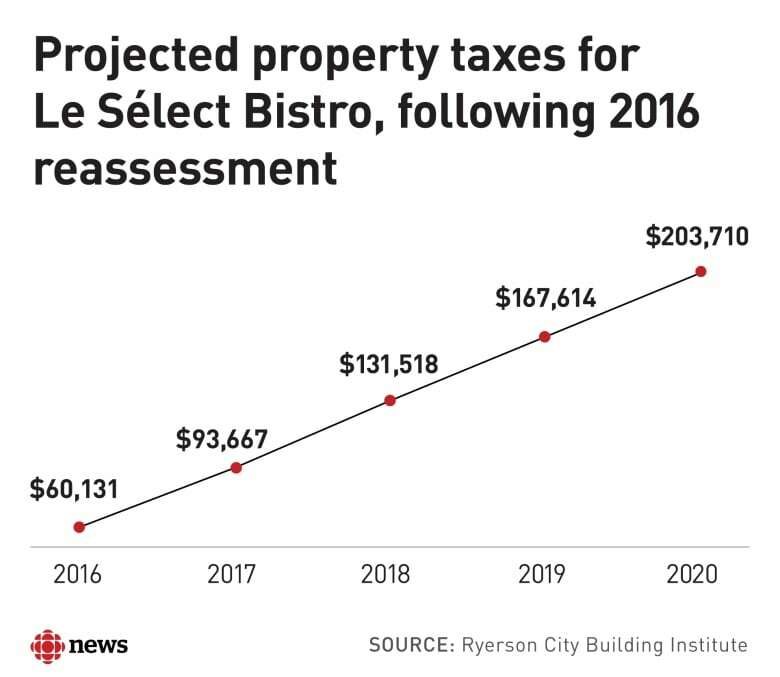 In the case of Le Sélect, the restaurant was paying roughly $2,000 a month in municipal tax a little over a decade ago. By 2020, that amount could jump to nearly $17,000 a month. "I'm being taxed on the hypothetical value of a building that I don't control, and that I'm not selling," Geisweiller said. The Municipal Property Assessment Corporation (MPAC) is the body responsible for assessing all properties in Ontario in compliance with the provincial legislation and regulations. To assess property taxes, MPAC looks at how much properties are selling for around the building it is appraising in order to determine its current value. That MPAC value is then multiplied by the city's tax rate to determine how much the property owner will pay. As a result, a booming real estate market like Toronto's translates into higher taxes for local businesses. It's what Cherise Burda, executive director for Ryerson's City Building Institute, calls a "perverse system" that looks at a commercial property's value according to what it could be, rather than what it is — creating a link between rising property values and rising commercial property taxes. "It's affecting our local main streets throughout the city... anywhere where there is really rapid growth," Burda said. Her team researched the impact of higher municipal taxes and found an alarming trend among small businesses in terms of their inability to handle the higher rates, which she says could lead to layoffs or closures in development-heavy areas. 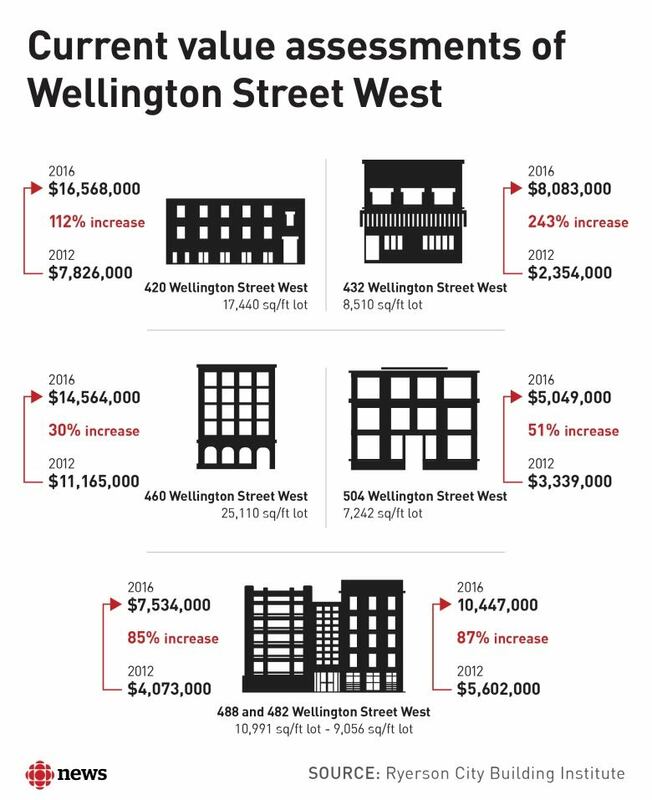 All along Wellington Street West, for instance, value assessments for buildings have skyrocketed, which means higher taxes. Le Sélect was valued at roughly $2.4 million in 2012, but its assessed value shot up more than 240 per cent four years later to more than $8 million. Other buildings on the same strip, which is currently home to multiple condo construction sites, have seen their assessed values jump by anywhere from 30 to more than 100 per cent, the Ryerson team noted. "That's kind of like if Revenue Canada were to assess our income tax rate based on what we could potentially be earning based on our wealthy neighbours down the street, rather than our paycheque," said Burda. Burda's team is raising red flags about the widespread trend through an upcoming exhibit called Taxed Out, launching on Sept. 12 at the Urban Space Gallery on 401 Richmond Street West. Le Sélect Bistro first opened its doors on Queen Street West in 1977. Over the years, it grew from one building to the next, before moving to a derelict building on Wellington Street West. Coun. Kristyn Wong-Tam, a panelist at the event's launch, has long been an advocate for Yonge Street businesses in her ward, including those which have struggled or shuttered in recent years. The "surges" are happening not just downtown, but in midtown at Yonge Street and Eglinton Avenue West and along Queen Street East, she said. "Which means those stable character neighbourhoods that define Toronto — they will be destabilized." Wong-Tam calls the city's 2018 tax cap a "band-aid solution." City staff are speaking to stakeholders and MPAC and have another report coming back to council next year, and she hopes that dialogue leads to a change in the assessment process, such as the addition of a small business tier that would classify those establishments more appropriately. And those wishing for that change may find renewed hope in the new provincial government. A competitive tax system is a key priority for the Ministry of Finance, says the Ministry's press secretary Robert Gibson. The province will also "continue to work with the City on property tax matters," he added. But will that discussion come in time? Geisweiller hopes so. "We'll stay in and we'll fight it out," he said. "In the end, I think reason will prevail."